I’ve been playing a mobile game recently, called Baking Story, and just unlocked the mint choc chip cupcakes! Which just so happens to be my favourite ice cream flavour. For those that aren’t familiar with the game, Baking Sorry gives you the opportunity to design your own bakery and have the chance to make baked goods for your ‘customer’s’. You can also share your bakery with friends that play the game and work together to increase your score so you can bake more complex items. 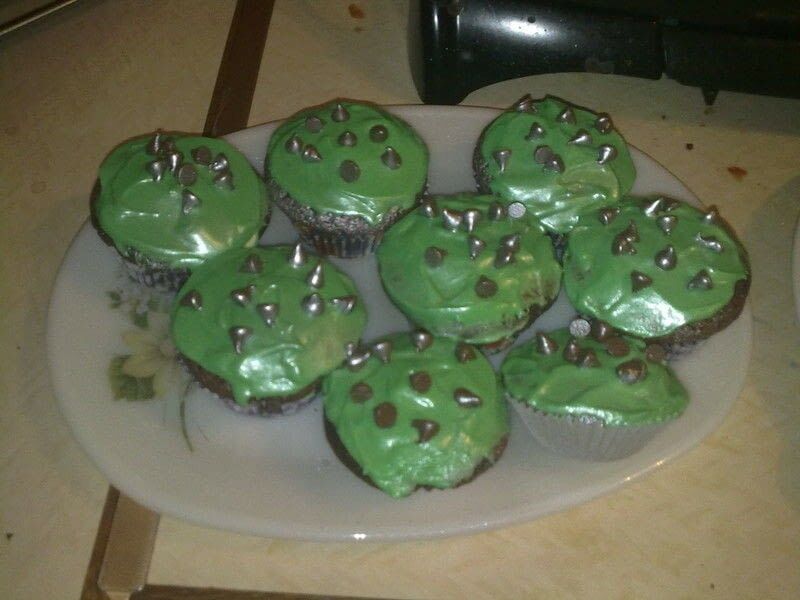 Like the mint choc chip cupcakes! Here’s how they turned out… I’m still working on my piping skills and think I could have done without so much glitter spray(! ), but I’m pretty happy with them as a first attempt. Round up your ingredients—beat the sugar and butter together until fluffy and light coloured. Beat in the eggs, one at a time adding the flour a little at a time until it’s all been added. Use a skewer to find out if it’s ready, if it comes out gunky—put it back in the oven! If clean, then put on a cooling rack. Make buttercream frosting (combining butter and confectioners sugar), adding mint flavouring and green food coloring and decorate the cupcakes with a pallet knife or piping bag. Spray with edible glitter spray (optional). What is your favourite ice cream flavour? Have you tried it in another form, such as baked goods? Let me know in the comments.